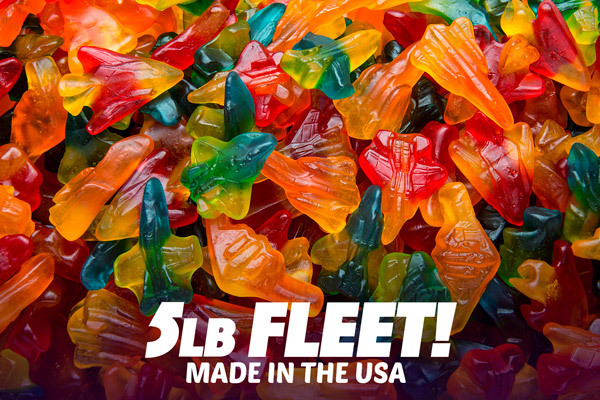 Gummy Jet Fighters: Five-pound bag of gummy aircraft. Gain air superiority and a delicious snack when you rip open a jumbo bag of Gummy Jet Fighters. These fruity flyers look like mini military aircraft but have none of the fuselage flavor. Instead, each gummy is armed with dual flavors to create a tasty candy combo. Use the five different types of aircraft in the pack to stage delicious dogfights. With a giant five-pound bag in your air force, you’ll always have a squadron at the ready to keep your sugar levels flying high. Tasty snack, locked on target. Engage! 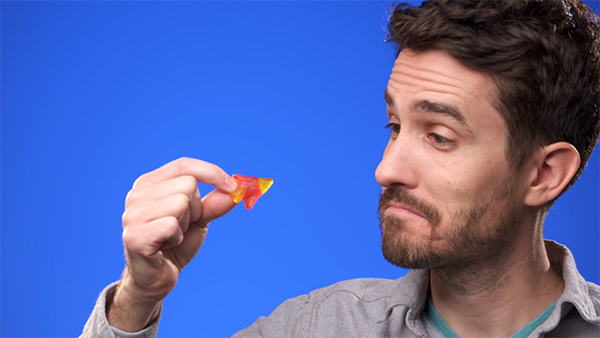 Gummy Jet Fighters have all the deliciousness of fruity gummy in shapes that are fun to play with (before devouring). Expertly land a fruity F-15 on your runway (tongue) or have it come in too fast and enjoy a different kind of sugar crash. This flight offers snack service. When you order Gummy Jet Fighters, you don’t get just a handful; you get the weight equivalent of a small dog in fruity, chewy candy. Like another branch of the gummy military, these Fighters arrive in a five-pound bag bursting with sweet deliciousness. That’s enough sugar to ensure you don’t have to refuel your candy cravings anytime soon. That’s some serious candy cargo. 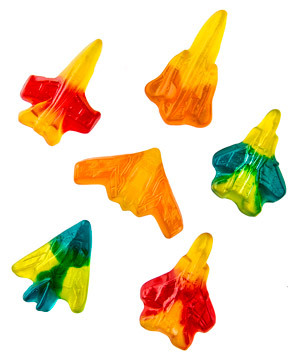 Gummy Jet Fighters come in five shapes modeled after real military aircraft like the SR-71 Blackbird, F/A-18 Hornet, B-2 Spirit Stealth Bomber, F-117 Nighthawk Stealth Fighter, and F-15 Eagle. No matter which craft you pilot, it’s guaranteed to taste delicious thanks to the three flavor combinations in each bag. Each fruit flavor has its own fruit flavor wingman. Question: Does each shape have its own flavor? 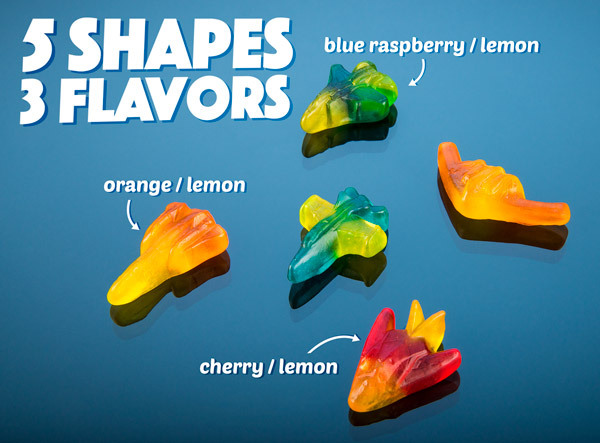 Answer: No, the five shapes of Gummy Jet Fighters each come in all three flavor combinations (randomly assorted). Question: How do they fit my dietary restrictions? Answer: Gummy Jet Fighters are nut free, gluten free, and dairy free. They are NOT vegetarian, kosher, or halal. Sorry! We're sold out until April 29. More stock arriving on April 29, 2019.